Former Secretary of State Hillary Clinton has continued bickering with President Donald Trump, even as she remains historically unpopular. Clinton fired back at Trump on Thursday after he accused her of colluding with Russia during the 2016 election. “Seriously, you asked Russia to hack me on national television,” Clinton wrote on Twitter, referencing Trump’s comment at a 2016 rally that he hoped Russia was “able to find” missing emails from Clinton’s time as secretary of state. Clinton’s tweet quickly went viral, racking up tens of thousands of shares. 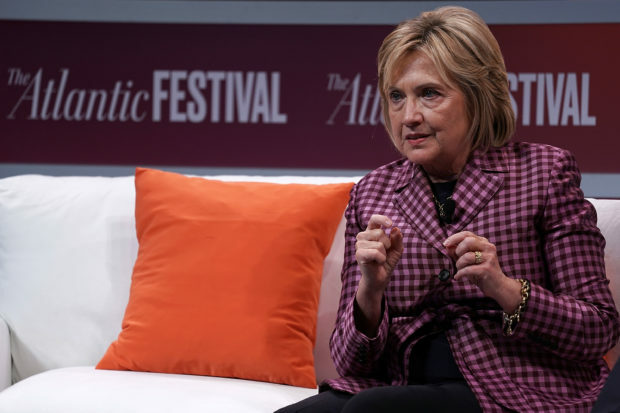 Meanwhile, a Gallup tracking poll released on Sept. 28 found Clinton’s favorability rating remaining at an all-time low of 36 percent, having languished since December 2017. The twice-failed presidential candidate rejected calls for civility in a CNN interview that aired on Tuesday, saying that “civility can start again” when Democrats return to political power. She and her husband, former President Bill Clinton, will embark on a 13-city speaking tour starting in November that will stretch over six months into May 2019.